On Thursday, November 8, UrbanCincy is partnering with the Walnut Hills Redevelopment Foundation (WHRF) and Teilen to bring Cincinnatians a unique storytelling event to take advantage of the crisp fall nights. 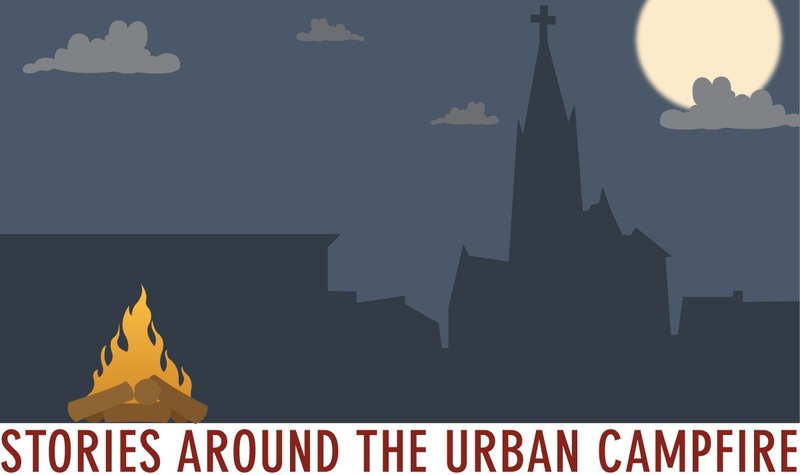 Stories Around The Urban Campfire will take place on November 8 and 29. Graphic designed by Brittany Coyle for UrbanCincy. Stories Around The Urban Campfire will start at 6:30pm and include approximately one-hour of storytelling, but those attending are encouraged to linger and enjoy the evening at DeSales Plaza (map). Food and drink will be available for purchase from Suzie Wong’s and Café DeSales throughout the evening, and there will be a temporary fire pit set up for people to gather around. The storytelling experience will be modeled after what Teilen uses for their other events, where each speaker gets approximately five minutes to share their story. Teilen founder, Joe Wessels, will be on-hand to moderate and keep track of time. UrbanCincy and Teilen are currently signing up people who would like to speak for approximately five minutes. There is a limited availability of slots, so please sign up as soon as possible by emailing urbancincy@gmail.com or joe@teilenrhine.com. Stories Around The Urban Campfire will take place next Thursday at 6:30pm, and it will take place again on Thursday, November 29 at the same time and location.